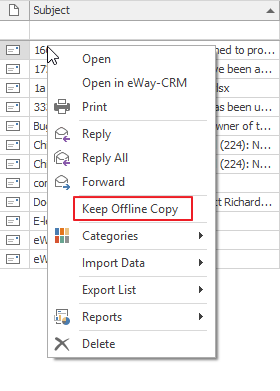 User right-clicks on email in eWay-CRM and selects Keep Offline Copy. After selecting the option, nothing happens - icon next to email is still same and when you right-click email again, you can see that Keep Offline Copy is not marked. But email can be opened. to solve the issue, download this file. Unzip the file on your computer and run the file. The value in Windows Registry related to eWay-CRM that solves the issue will be rewritten. Synchronization updates database and if you now try to mark email as kept offline, it is proceeded correctly.